One Happy Customer – Jedi I. Knight visits VS Custom Hats! Art was interviewed by his local newspaper. The Southern Oregon Magazine wrote an article on Art’s work. 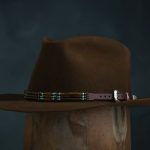 The Fedora Lounge – A Golden Era blog showcasing Art’s hats for many years.